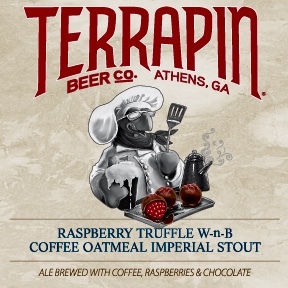 Intersting Brews: Terrapin – Raspberry Truffle W-n-B, Coffee Oatmeal Imperial Stout Brewed with Coffee, Raspberry, & Chocolate. Brweed with pure liquid cacao, raspberry, & coffee from Jittery Joe’s, this delectable Imperial Stout is a dessert lover’s dream come true. 9.4% ALC, 1 Pint 0.9 Fl. Oz.